Alethea http://lilodesigns.blogspot.com/ then you are hopping the correct plank! I added gems to the treasure chest! For my second project I have made an easel card. For the front of the card I printed an old map from the internet, distressed the edges with ink and tore and curled some of it. 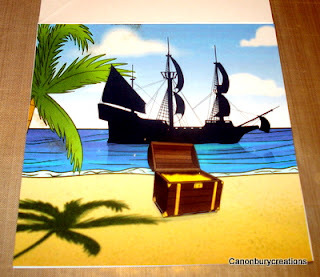 I cut out an image of a galleon and raised it up with foam pads. 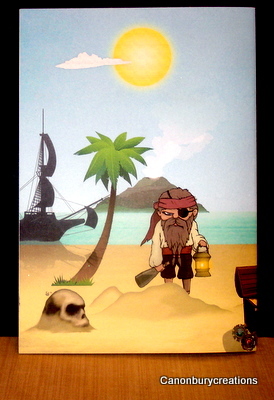 The pirate is a digi image that I printed out a couple of times and decoupaged. 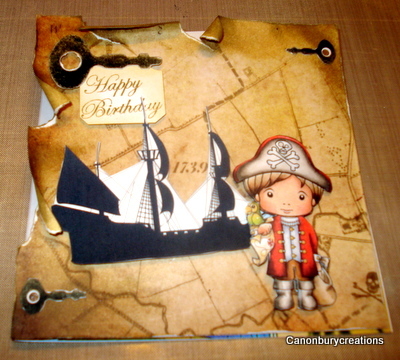 The inside scene was created on Craft Artist and I used the treasure trunk as the stopper. 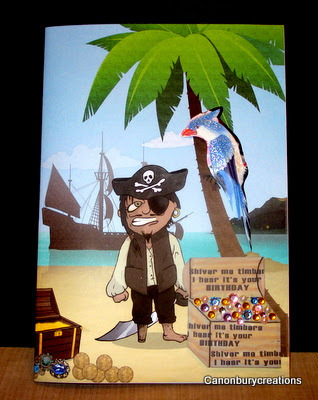 Fabulous card Val...any little boy would just love it.. They be thar some great pirate projects Cap'n Val! Yer nephew goin' t' love th' card. I've ne'er heard o' Craft Artist but it sure looks good! What a great idea and I love both of your projects - very piratish (is that a word?? )I don't think so. ahoy matey! what wonderful projects ye have made! A true treasure! I'm excited to be a new follower looking for to seeing even more!! YO HO HO Pirate Val it be Capn Gill checking in! Your card is adorable. Thanks so much for sharing your card. Great idea Valerie! Every little boy is fan of this! Fabulous cards Valerie! I have never heard of Craft Artist - definitely need to check it out. 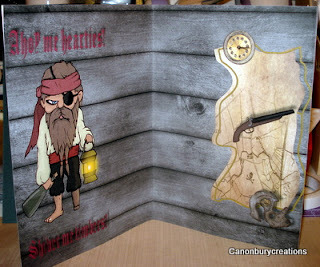 Love how you did the easel card with the treasure chest as a stopper! Very fine pirating girlie! LOL...that first card just cracks me up!! Fabulous cards! 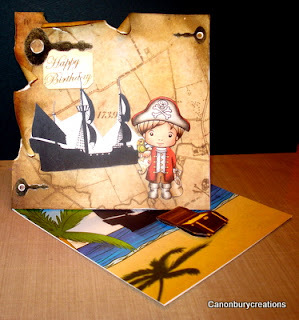 fab cards, never heard of Craft Artist, I am definitely going to google that!!! I really like both your projects. How cute! You're nephew is going to be one happy pirate. Jearise in Lorby's world. Your cards are fantastic! Great pirate projects. These are super cute! My nephew would love them. :0) I think you need to make one more using a Cricut cut and enter our challenge over at http://fantabulouscricut.blogspot.com this week. What do you think? ;) TFS!